aul started working with Dom around 6 months ago. Dom was already established and playing at a Cat 2 academy but was looking to take his individual game to next level. Saul spent time analysing his game and developing a training programme that focused on his individual explosiveness, first touch and ball striking techniques which were specific to his preferred position (full back). Training sessions then focussed on implementing these techniques and building up to match tempo. 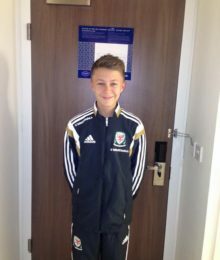 Dom has applied the individual elements learnt during games and his decision making when in possession of the ball has vastly improved such that he has now been called up to the Wales U15 squad, despite only being an U14. I’m very proud to have supported another player into International Football. Dom’s progression really goes to show where hard work and determination can get you. If he carries on like this he has a really bright future. Well done Dom!